As a result of several successful years working with a number of leading hotels in Berlin, we would like to draw your attention to our list of recommendations in two tables. Please book early in order to ensure a reservation at your chosen hotel. Booking deadlines cannot be extended. 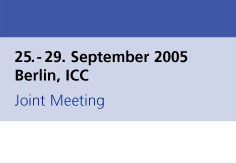 The world-famous Berlin Marathon is due to take place on Sunday, 25 Sept. 2005. Reservations on this list should be made exclusively through Porstmann Kongresse GmbH. The reservation deadline for these hotels is 30 June 2005. Reservations on this list should be made directly via the chosen hotel. Quote the keyword: "SOE 2005"